One of the most enjoyable parts of preparing for a Thanksgiving to remember is setting a beautiful, inviting table that friends and family will enjoy. We found some unique ideas to express a bit of creativity and spice things up by mixing in some interesting fall-friendly elements with basic floral arrangements and candles. Organic pieces that reference nature such as raw wood and twigs can be used as interesting accents in centerpieces. Burlap fabrics are a great material for runners and placemats combined with mercury votives and metallic accessories for a rustic luxe theme. 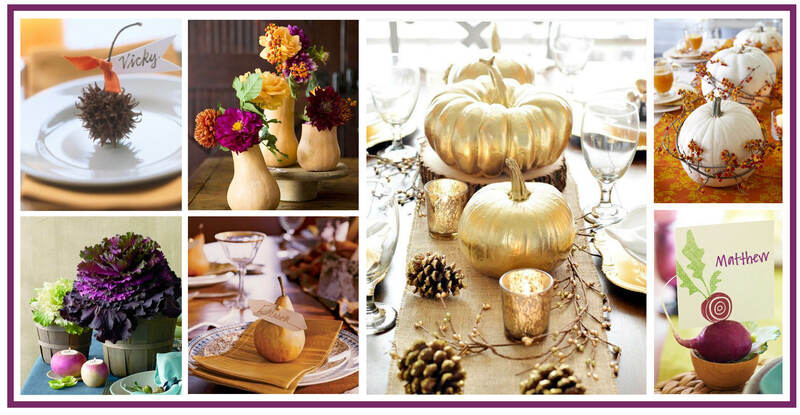 Pumpkins, gourds, radishes and turnips can be repurposed as vases, votives and place card holders. All these ideas can really make your table a stand out with guests. You can find additional ideas for expressing the bounty of the fall season on our Pinterest board by clicking HERE.